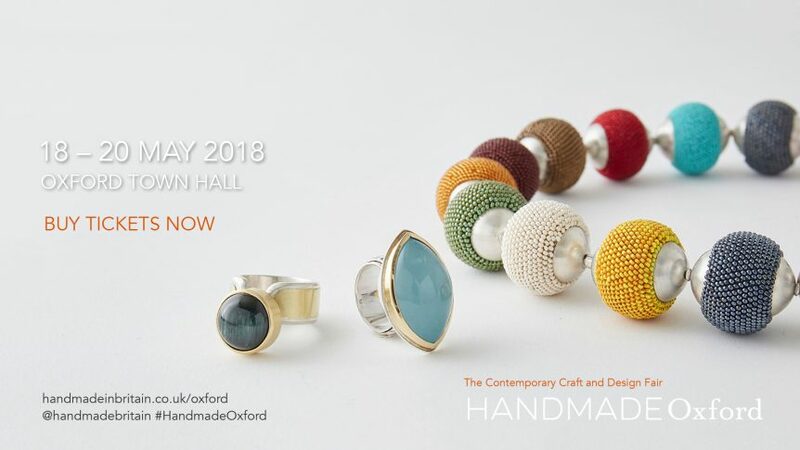 Renowned contemporary craft and design event organiser, Handmade in Britain, is launching a new three-day fair to take place at Oxford Town Hall this spring. Running from Friday 18 – Sunday 20 May, Handmade Oxford is a fabulous opportunity to meet, commission and shop directly from over 90 highly-skilled designer- makers showcasing their innovative and contemporary designs across a wide range of disciplines. Visitors to the event will be able to choose from a handpicked selection of textiles, jewellery, ceramics, glass and so much more. Taking centre stage in the heart of Oxford, this three-day selling event will offer visitors the opportunity to buy one-off pieces directly from designers, makers and craftspeople from across the world and learn about the ideas and processes that shape their work. Discover a flurry of exquisite jewellery at Oxford Town Hall this May, just in time for wedding season. Lucy Martin’s sleek, colourful and distinctive designs are tastefully pared to allow the natural qualities of the gemstones to shine, while Isabelle Capitain combines traditional methods of making with modern technology, resulting in delectable, minimalist Bauhaus-inspired jewellery in precious metals. Ulli Kaiser’s playful, organic shapes in gold, silver and an array of rich, harmonious colours invite you to touch and Sabine Konig combines precious metals with vibrant gemstones to produce classic pieces with a modern twist. Leading textile and fashion designers will showcase their latest collections at Handmade Oxford, alongside the most exciting emerging talents. Give your home a bold new look for spring with Camilla Thomas’ woven interiors, inspired by the island of Anglesey coast and Harriett Grist’s CHICKPEA contemporary collection of homeware and gifts made from lambswool in striking colours. Celebrate your unique style by exploring Terry Macey and Angelika Elsebach‘s fabulous spring/summer collection of timeless women’s fashion made from natural fabrics. Complete your wedding outfit with a sensational silk scarf from Helen Chatterton’s in-demand City on Cloth collection or stand out in one of Wendy Edmonds’ distinctive ripple and crepe scarves. Meet the makers behind a handpicked selection of contemporary ceramics at Handmade Oxford and find out all about their different processes. Style your home with Ela Niznik’s elegant, slip-cast, vintage-inspired porcelain vessels, adorned with nostalgic images inspired by nature, or Caroline Egleston‘s exuberant, painterly and colourful Piccolpasso Handmade Tiles. Impress your guests with enviable tableware and bespoke bright-white paper-thin porcelain lighting solutions by Heyning W/D Studio, or Lindy Barletta’s colourful and textured statement pieces inspired by nature. Choose from an array of artisans working in glass and silverware at Oxford Town Hall this spring. Discover functional and unique glass designs by Banu Oyman or commission a bespoke kiln-formed and fused glass piece by Aline Johnson who specialises in chandeliers, table and wall lights. Contemporary silversmith Loucinda Nims creates functional silverware inspired by landscapes, preciousness and architecture, Bishopsland Educational Trust presents a selection of bespoke handcrafted silver made by emerging talents. Purchase and commission bespoke wooden boxes and furniture at Handmade Oxford. Born out of a desire to create magical spaces through scene-stealing statement lighting and contemporary furniture, Neb Abbott creates stunning sculptural designs. Armando Magnino creates elegant, asymmetric pieces featuring innovative design solutions, which allow the beauty and warmth of wood to speak for themselves. Talented Hollywood prop maker and gifted craftsman, Craig Narramore, enhances the simplicity of natural burr, walnut and beech by invoking his signature style.